Southeast New Mexico. Eddy County. Closet City or Town: Artesia; Carlsbad. In the shadow of the Guadalupe Mountains (8,749 feet/ 2,656 m), on a plateau at the south side of Walnut Canyon. Entrance is 18 miles (29 m) southwest of Carlsbad. Area: 46,765 acres (73 square miles/189 km²). Take me to the bat cave! (But Batman doesn’t live here, just zillions of bats and caves, galore!) A subterranean haven of colossal chambers called “rooms.” But refrain from touching any spectacles on display!. Carlsbad is one of the premier limestone caverns in North America; also premier for an exhilarating evening bat show (in season). 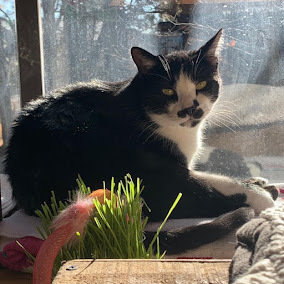 Focus: geology, human history, and bat ecology. Carlsbad Caverns, “The Show Cave Tour,” begins rather dramatically in the Underground Lunchroom some 750 feet (230 m) below the entrance. Approximately two-thirds of the park has been set aside as a wilderness and preserves a fragile habitat of Carlsbad’s subterranean environs, as a world unto itself. 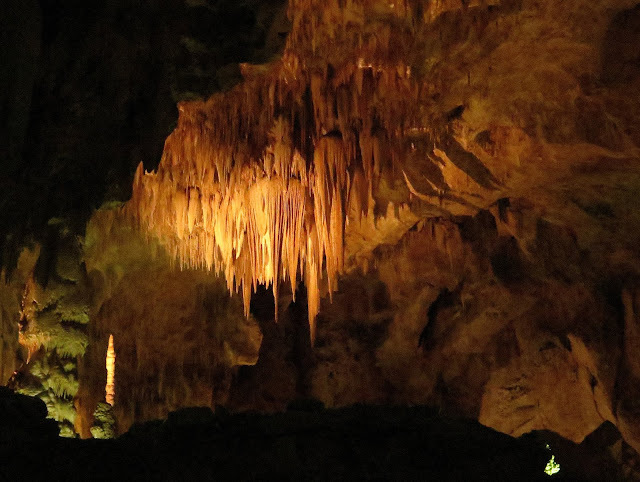 The interior of the caverns is illuminated (at least, to some degree), which highlights the formations. 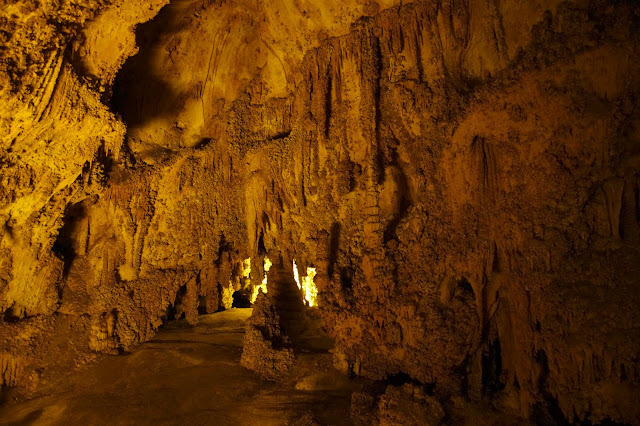 A literal cavernous chamber––the Big Room––is one of the caverns most frequently visited setting and gathering place for gawking tourists. This natural limestone showcase is nearly 4,000 feet (1,219 m) long, 625 feet (190.5 m) wide and 350 feet (about 107 m) high at the highest point ranks as the third largest chamber in North America and the seventh largest in the world. (For Jeopardy aficionados––Where is the largest chamber? Answer: in Malaysia––the Sarawak Chamber.) At Carlsbad, the tour includes well over two dozen chambers––rooms. Most tours are, therefore, escorted by knowledgeable guides (or docents may be the better word for it). However, there are some sectors of Carlsbad one can tour on his or her own. Hence, self-guided. These are also the more squeeze-tighter places, which spelunkers (aka “cavers”) enjoy exploring. The exercise also includes belly swimming in some sectors and not the kind of places for people who are prone to claustrophobia. 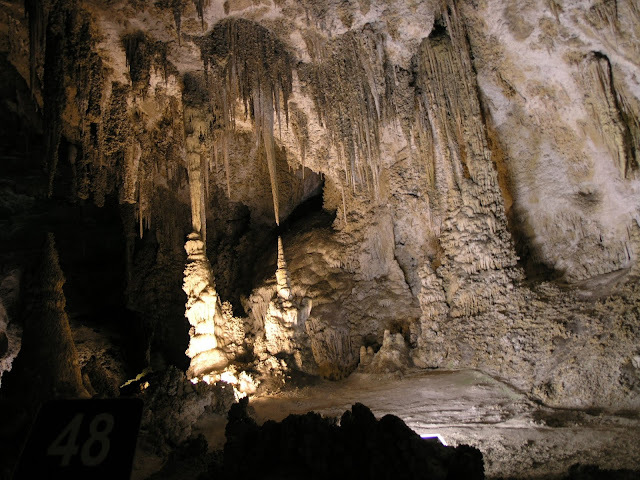 The town of Carlsbad, New Mexico, which lends its name to the celebrated caverns and the national park, is, in turn, named after a Czech town formerly known by the German name, “Carlsbad” (whose modern spelling is Karlsbad). In 1923, this fascinating subterranean world became popular, and, therefore, deemed important by the government to protect its nocturnal sanctuary. 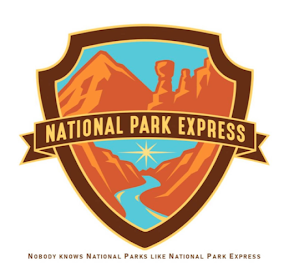 Eventually, the environs earned a national monument designation, and seven years later, a national park. 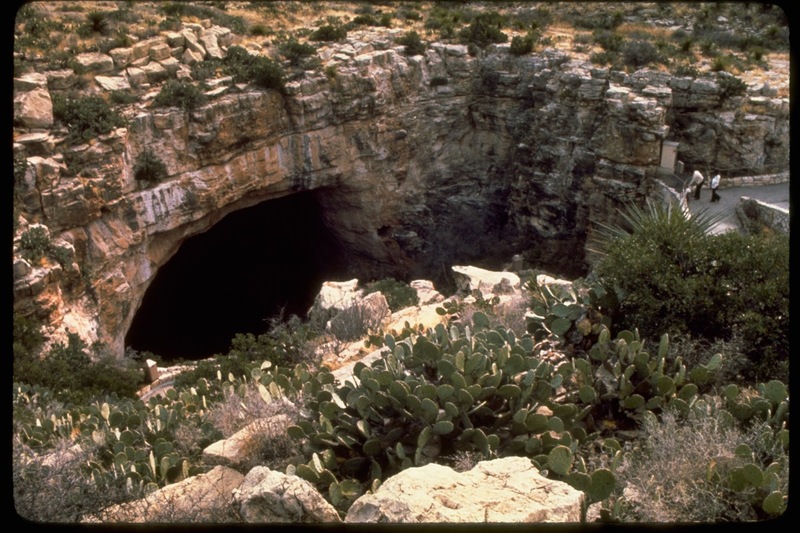 In 1978, Carlsbad Caverns Wilderness was additionally established with the National Parks and Recreation Act. 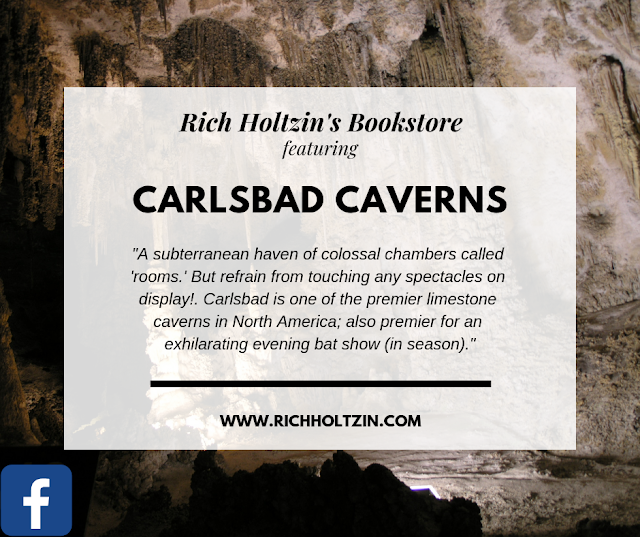 Carlsbad is all about the underground, including bats that live in extreme darkness. The story of this massive underground world begins about 200 and 50 million years ago, with the creation of a 400-mile-long (643 km) reef in an inland sea that once inundated the region. This horseshoe-shaped reef was formed from the remains of sponges, algae, and seashells; also from calcite that precipitated directly from the salty water. Cracks eventually developed in the reef as it grew seaward. Later in time, the sea evaporated, and the reef was buried under deposits of salt and gypsum. After mere few million years uplift and erosion began to uncover the buried rock reef. Rainwater, which was made slightly acidic from the air and soil, seeped down into the cracks of the reef dissolving the limestone over the eons. Incredibly, this simple and timely process would eventually form large underground chambers though free of water. At the same time, hydrogen sulfide gas migrated upward from vast oil and natural gas deposits beneath the ancient reef. The chemistry reaction is important to note because the gas dissolved in the percolating ground water. Consequently, the process created sulfuric acid. The collateral effect of this potent corrosive substance explains the size of the passageways. 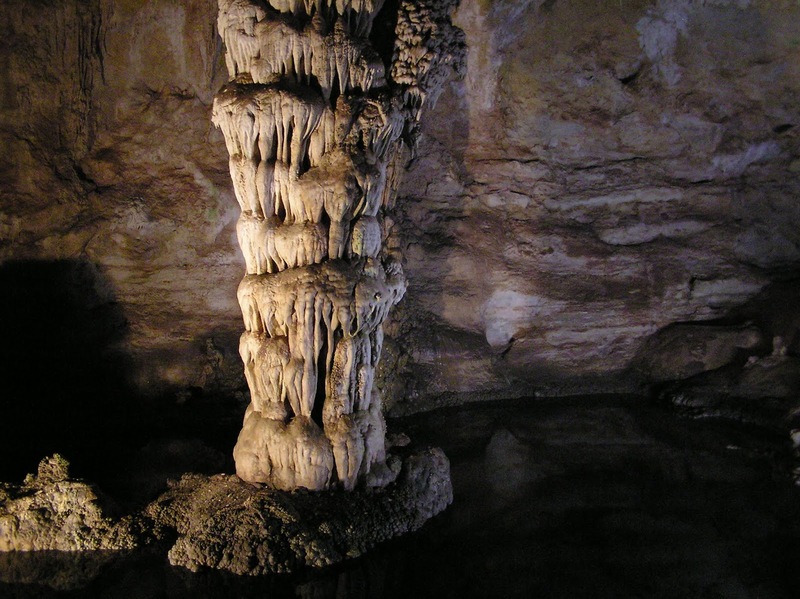 Over time, the exposed reef became part of the nearby Guadalupe Mountains, and the underground chambers (called “solution caves”) became the marvel of Carlsbad Cavern. NM Hwy. 7 and turn north from Hwy. 62/180 at Whites City (16 miles/25 km) southwest of Carlsbad, then 150 miles (240 km) northeast of El Paso TX. Entrance follows a 7-mile (11.3 km) route from the park gate at Whites City to the Visitor Center.